Red is an emotional intense color and also the color of love. 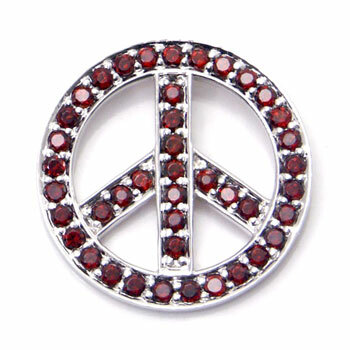 That is why the red garnet stones are chosen to ornament this peace symbol pendant. In combination with the white gold rolo necklace, this pendant would look so splendid on you. With the intense color and the charming look from the necklace, you would easily grab attentions from across the room. With it, you will spread your love like a fever.